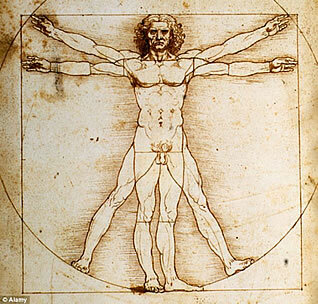 Da Vinci's Vetruvian Man drawing shows an Inguinal Hernia. A recent review by medical experts points to evidence that Leonardo Da Vinci's classic study in human proportion may well have had an inguinal hernia. 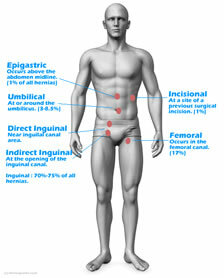 The bulge described by Mr Hutan Ashrafian, a lecturer at Imperial College London was published in an article in Hernia Journal and builds a strong case for an asymptomatic left inguinal hernia. Other experts have endorsed the opinion including Michael Rosen, the director of the Comprehensive Hernia Center at University Hospitals Case Medical Center. The pen and ink on paper drawing was a combination of Da Vincis's obsession with geometry and proportion. Da Vinci illustrated what he considered the ideal human male form. The irony is that that the bulge is clearly not symmetric yet Da Vinci retained every detail in the drawing. The drawing is kept in Venice and is rarely displayed to the public.